Thanks Mama is a wonderful place to buy cloth diapers for your baby's needs. I have personally been in contact for a little while with the wonderful owner, Helena, whom I'm looking forward to meeting in person in Boston this weekend! You'll love the variety and the prices at Thanks Mama. Helena was kind to let my sister and I test drive two different brands of cloth diapers with our babies, the Kissaluvs Marvels One Size and the Happy Heiny's One Size. Kissaluvs Marvels highlights: My sister is a first time cloth diapering mom, the Kissaluvs Marvels One Size diaper is her first experience with cloth. The photos are of the diaper on her adorable 3 month old. I wasn't there to give her pointers, so the rise is not adjusted to the smaller size. Doesn't it look crazy cute though?! Things we love about this one: no need to take out insert - just dump in the wash, easier to stuff, great elastic at waist and legs. The 'no-stuffing' claim is a little misleading. Yes, you don't have a separate insert to stuff, but you still need to stuff this one in when it dries - it is just a little easier because it is attached. Oh, and did we mention the great fit? It is highly adjustable and will look great on any baby. 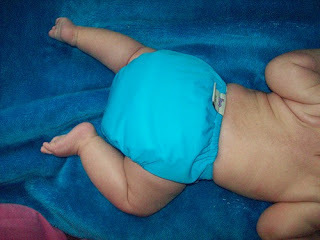 A great diaper for the pro or a newbie in the cloth diapering world! Happy Heiny's One Size highlights: There are many things we like about the Happy Heiny's. First of, one size is always a plus in my book. The two microfiber inserts that came with it are super absorbent, we've been using it at night mostly and it works great! The only small issue we had was that the smallest waist setting is too small and the next one after it is too big for us, so there's a bit of a gap in waist sizes. Maybe I wasn't snapping it right, but I'm pretty sure I was fastening it correctly. It is not a big deal, we still use it regardless on the setting that's a little large. Despite that, it still has an elastic in the back - so everything is contained well, it is in the front that there is some space between the tummy and the diaper. Store Values: If you're looking to get a complete cloth diaper stash and are starting from scratch, Thanks Mama has great packages available where you can save money by buying all the diapers you'll need at once. They also have a great clearance section, you can find saving as much as $8.50 per diaper right now! There are always new items added there. You can get the Kissaluvs Marvels diaper for $22.95 and the Happy Heiny's for $18.95. Be sure to sign up for the Thanks Mama newsletter as well if you want to be in on the latest deals. Website Design: I still remember the old Thanks Mama website design and I can say it has certainly come a long way! It is now very easy to navigate and there is a lot more merchandise variety, so one stop shopping is a possibility. Items offered in the store: I've counted 22 different cloth diaper brands in the Thanks Mama store! So if you're looking for a great selection, this is your store. There are also 5 different kinds of training pants, some baby toys, baby carriers, babyLegs, bibs, bedding, baby care items, and select items for mom. Who Would You Recommend this to? New cloth diapering mamas, stash updating, fluff addicts, and those looking for great deals.